Fern House Working Mens Club, Flushdyke, Ossett and Concert Night 1950s with the last game before “Artists Perform” in the Snooker Hut, but only after the table was covered. Fern House was Ossett's first working men's club. Now closed, it had been in existence for over 100 years and had a long association with Ossett Town Football Club. In 1936, at a public meeting chaired by the Mayor of the Borough of Ossett, a former Yorkshire League referee called John Carter was given the task of bringing to Ossett the highest possible standard of football. Ossett Town was established with John Carter as Chairman and the team played their games on land to the rear of the Club. The players got changed in an ex-railway goods wagon in the same location. 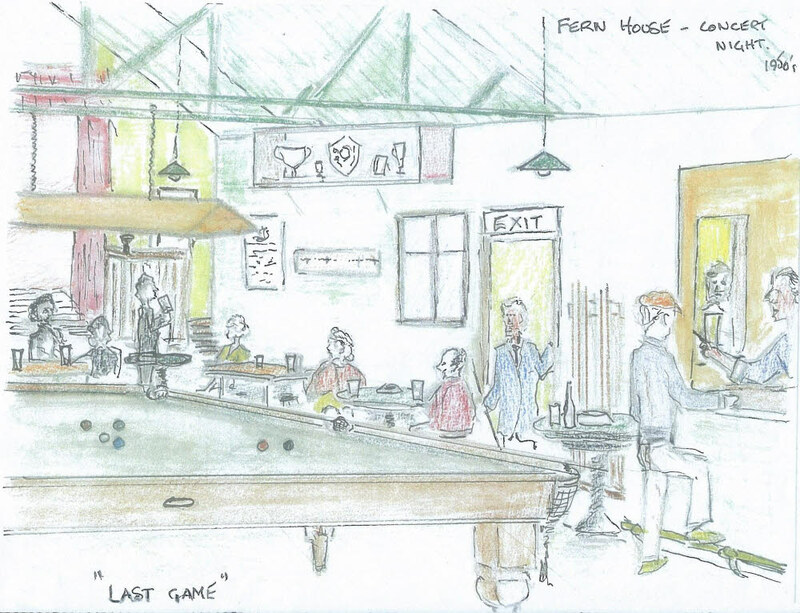 During World War II, the team had to use a pitch on Back Lane when the army commandeered Fern House. In January 1957, John Carter sold Ossett Town player, Derrick Blackburn, to Swansea Town for £1,350. This was a huge amount of money for an amateur football club and it enabled Ossett Town to acquire the Ingfield site in the centre of Ossett and the club moved to their new ground in 1959. In recent years suggestions were put forward for the Ingfield site to become home to a well know supermarket chain store but Ossett Town retain the site (June 2016) and still play their home games at Ingfield. The President of Ossett Town, John Carter, died in 1994 at the age of 88. He had performed every role within the club, including chairman, secretary and team manager. In his 87th year, in spite of an earlier stroke, John was still able to perform somersaults. This sketch is of the inside of a green shed at the left of the main building. It was the snooker room, and sported a full-sized table. At the far end of the snooker room was a stage and at weekends or evenings, snooker was suspended, the table was covered over and paid singers or comedians performed in the ad hoc concert room. During the week, the club had its own "comedians and singers" who appeared regularly in front of a dedicated Committee. The Colliers were the steward and stewardess of Fern House WMC and Albert Scholey was the Secretary of the WMC.